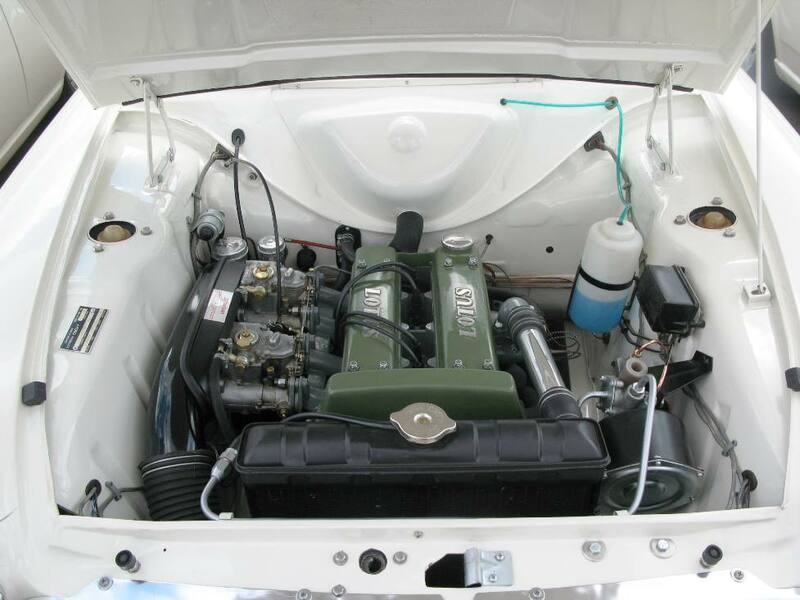 This section establishes the main features of the different variants of Mk1 Lotus Cortina, and identifies the changes that were implemented from Feb ’63 to Aug ’66. Note that the dates used are the dates from which the changes were made at the factory, as per the parts book. These dates tie in with the date code on the chassis plate of the car. That date of manufacture of the car, along with the chassis number, was allocated when Ford had completed their part of the manufacture of the car. The part completed car was then sent to Cheshunt for final assembly, and then be sold, so the registration date could often be 2 months after the build date. This is further complicated by the launch dates of new models (Aeroflow, Leafspring Aeroflow) which could be up to 3 months after the date of manufacture. For example, the earliest Aeroflow cars started to be built (at Dagenham) in August 1964, but they weren’t launched until the Motor show in October 1964. The leaf spring version of the Lotus Cortina has it’s change dates recorded in the parts manual as June 1965, but it wasn’t (officially) launched until October 1965. That was a particularly complex transition but more on that at the bottom of this article. Type IV – The LHD Aeroflow car with the leafspring suspension. This section identifies the timeline and changes for the Mk1 Lotus Cortina throughout it’s 3 1/2 year life. The specification of the Mk 1 was to change quite considerably, to improve reliability and reduce warrantee costs, to reduce the unit cost and to accommodate the major change in the Mk 1 range, the introduction of the Aeroflow ventilation system. Also, for each variant of car, have a look at ‘Mk1 Road Car Studies’ that shows each of the variants being discussed in some detail. To establish the ‘baseline’, this was the specification of the car when it was launched. This was the original road-going version of the production race car as designed by Lotus. The car is based upon the heavy duty 2 door 1200 deluxe floor change RHD shell, with some modifications to support the Lotus change. From the outside the car is characterised as having the early grille with separate oval ‘Butler’ sidelights, opening door quarter-lights and rear side windows, and a ‘Consul’ badge on the bonnet. It has lowered suspension with 5.5 inch steel wheels, and is nearly always Ermine White with a green flash down the side and across the back panel. It has quarter bumpers at the front, with a standard bumper at the rear, and three (painted) Lotus roundels were fitted; one on the grille and one each side on the rear wings. 4 inch Tachometer reading 0 – 8000 rpm, with safety chaplet from 6500 – 8000rpm. 2 inch combined water temperature and oil pressure gauge. 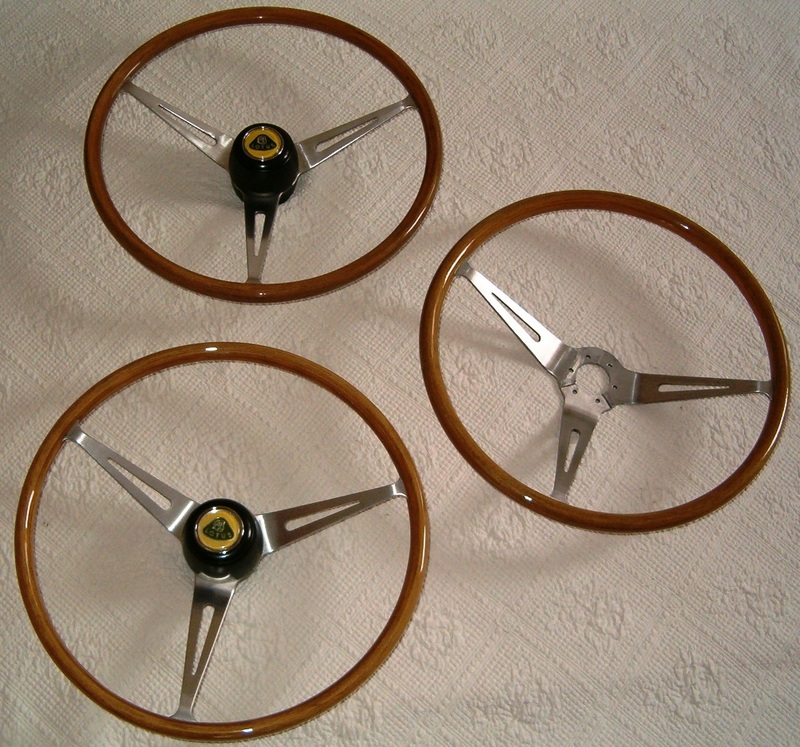 A 15 inch studded Springall woodrim steering wheel with spokes in a ‘Y’ shaped configuration and a green / yellow Lotus badge horn push is fitted, and a chrome handled umbrella type handbrake located to the left of the steering wheel under the dash. A centre console is fitted specific to the Lotus. The painted panels inside the car are body coloured (white), and a rubber Dunlop ‘Hightone’ carpet, in three pieces (left centre and right) is fitted. The seats are re-worked standard versions with improved side supports. The switches and cables are all standard Cortina parts, as is the rear view mirror, sun visors, interior light and the ‘Confetti’ style headlining. Under the bonnet is mounted the 105bhp Lotus Twincam engine, with the air filter canister in the nose of the car as per the Elan. The cam cover is painted a dark hammered blue colour, with the engine painted in ‘Lotus Grey, a colour very similar to Ferguson Tractor grey. The servo is mounted to the rear of the engine bay on the passenger side inner wing and on the bulkhead, with the horns bolted to a bracket on the passenger side inner wing. The gearbox fitted had the close-ratio gear-set, and has aluminium castings for the bell housing and remote. The propshaft is one piece with the main tube diameter of 3 inches and the ends swaged to take standard production UJs. The front suspension is redesigned using a shortened spring and McPherson strut with heavier damping properties, fractionally longer forged (rather than pressed) track control arms to eliminate wheel camber, and a heavier duty anti-roll bar some half inch longer at the ends bar to reduce castor. Shorter and straight steering arms were employed to effectively give higher steering gearing, whilst reducing the Ackermann angle. The rear suspension has been modified to replace the leaf springs with coil-over shock absorbers. The back axle is essentially a standard Ford Banjo axle with modifications to accept the link control system that replaces the springs. This consists of a wide ‘A’ Frame bracket, adapted from the Lotus Seven design, with the single point at the axle and arms attached to the body on the inside of the chassis rails in front of the axle, together with two further anti-tramp bars set on the outside of the chassis rails. . The rear suspension is lower than the standard car, and an aluminium differential nose housing is used to reduce un-sprung weight. 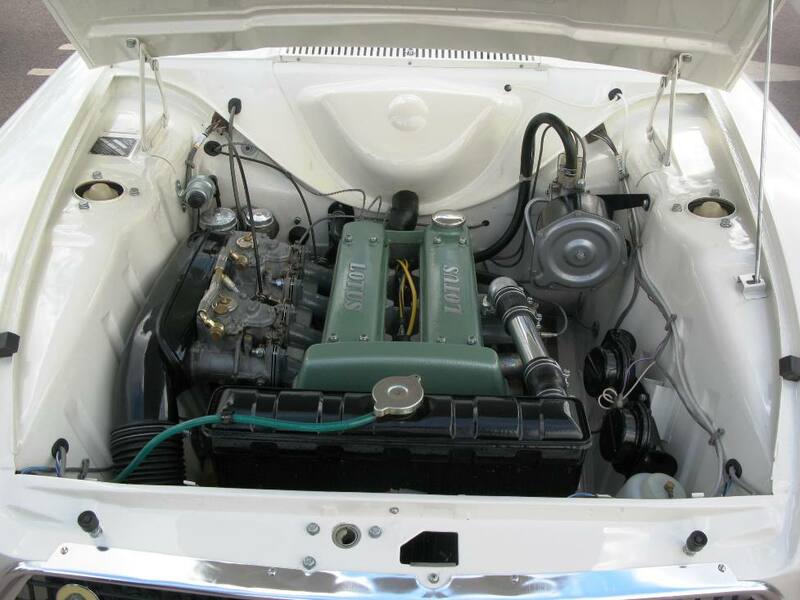 There are a few body modifications for the Lotus Cortina, primarily to accommodate the ‘A’ Frame suspension, the lower stance of the car, the battery mounted in the boot, and the need for weight reduction. A large rounded hump spot welded into the boot floor over the axle to provide increased clearance for the top of the differential. Modified saddles on the chassis rails over the axle to provide increased clearance for the axle. These saddles have a ‘Vee’ section cut out and re-plated. Tubular ‘King Posts’ are added to the shell in order to triangulate the top of the rear wheel tub (where the new coil-over springs are located) with the chassis rails, replacing the strengthening lost when the leaf springs were removed. These posts (or bars) can be seen inside the boot on either side, but a corresponding pair are hidden inside the passenger compartment, behind the rear quarter trim panels. The king posts interfere with the normal spare wheel mounting position in the wheel well on the nearside of the car, so the spare is stowed flat on the floor using a bolt locating into a captive nut, with re-enforced plate under the floor. The king posts also interfere with the boot lid support springs used in the standard car, so these are removed, being replaced by a sliding captive support mechanism (Anglia bonnet support). The battery is mounted on the right hand side in the boot, with no battery tray under the bonnet. The chassis rails at the rear of the car are double skinned just beyond the original leaf spring shackle points (a standard ‘heavy duty’ shell feature). Aluminium doors, bonnet and boot are fitted. The front wing arches are rolled to permit wider wheels to be fitted without rubbing. The other modifications to the shell were minor, usually consisting of holes in different places to accommodate battery and handbrake cable routing, rear wing badges, air cleaner support etc. Jul ’63 Cars now issued with Owner’s pack, including handbook, service book, Ford Service guide and parts list. (Oct ’63) Rear panel changes from flat metal around petrol filler tube to swaged metal. (Oct ’63) Rear light cluster bezel design change to less pointed centre boss. Oct ’63. 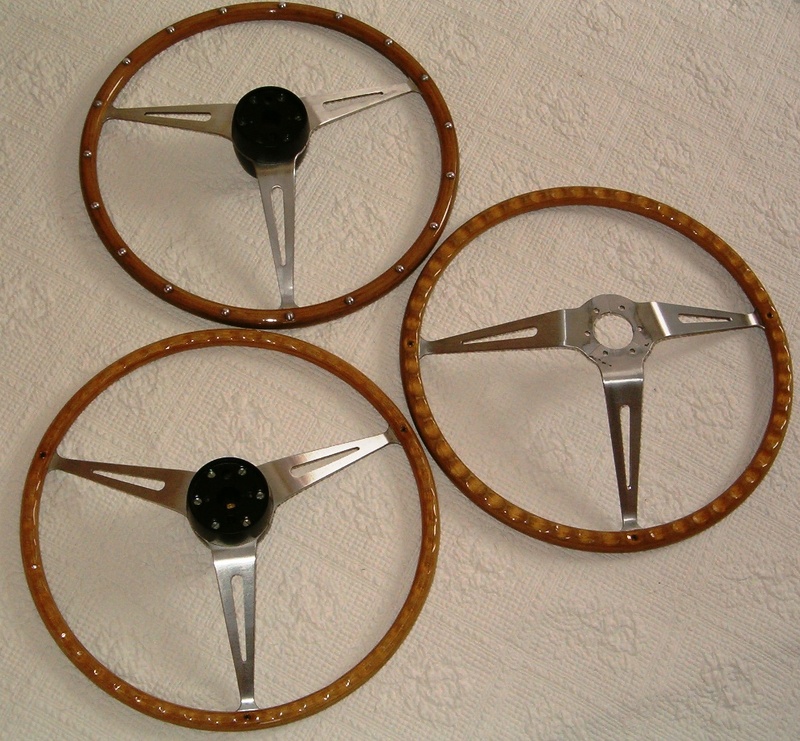 Studded (Y shaped configuration spokes) woodrim steering wheel replaced with non-studded version, still with the same configuration spokes. 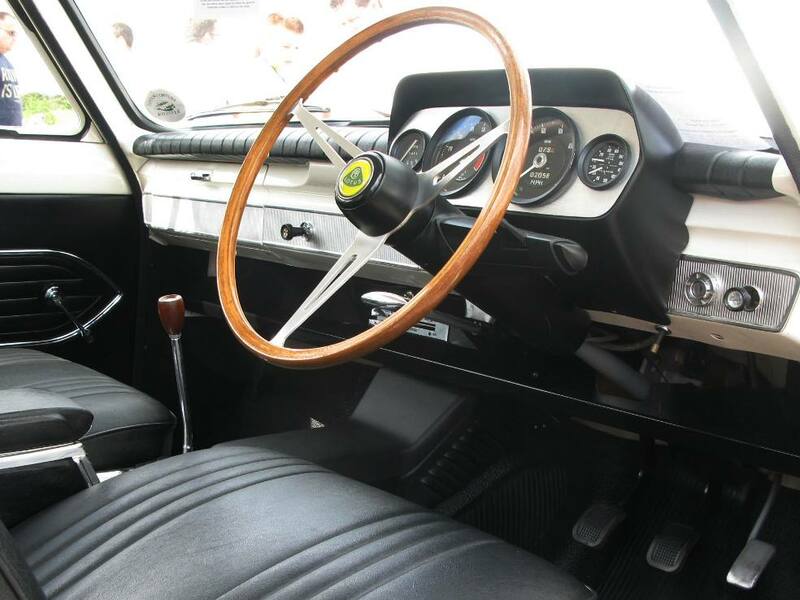 Oct ’63 Horn button moved from control arm end to horn push in steering wheel centre. Old horn push on control arm becomes headlamp flasher. Steering wheel boss modified. Oct ’63 Direction Indicator instrument changes. Oil lamp in speedometer now used to indicate left indicator, and existing indicator warning lamp shows right indicator. Oil pressure lamp deleted. (Nov ’63) Three piece rubber mats (left, centre, right) replaced with 2 piece (front and rear) mats. As per Deluxe cars. Jan ’64 S/E Option offered. See S/E specification at end of this document for description. Apr ’64 Service bulletins (workshop manual supplements) start to be issued to Ford dealers, starting with ‘Fuel System’, ‘Distributor’ and ‘Engine’. Jun ’64 Beginning of the phase-out of aluminium body panels as well as cast aluminium gearbox and diff parts (as standard build components). Mostly complete within 2 months, although many cars were still ordered with ‘optional’ aluminium parts. Jul ’64 Replace 1 piece ‘Torpedo Propshaft’ with two piece ‘Split Propshaft’. Oct ’64 Recall to implement axle housing modifications carried out in Jul ’63 for all vehicles prior to number 276. Full width grille incorporating amber flashers, and air vent on rear roof pillar. Opening front quarter-light now option only on UK cars, standard on export cars. Rear side windows now fixed. Aeroflow system incorporated in car with fresh air ‘eyeballs’ at either end of the dash. Complete revision of dash layout, instruments and driver controls. Horn push now on stalk which also flashed the headlights and operated the indicators (as per standard Cortina). Deeper-dished ‘T’ spoke configuration steering wheel. Horn push (dummy) badge now black and silver, replacing the traditional green and yellow of the Lotus badge. Interior paintwork changed to satin black. Seat Trim Change to Lotus Type 3, Ford Code B304. Lotus loop pile carpet replaces rubber carpet. High tensile studs fitted between differential carrier and axle housing. Polyurethane bush replaces metalastic threaded bush at ‘A’ Frame joint to axle, providing lifetime lubrication. The standard Cortina steering ratio (15 : 1) employed in lieu of the GT ratio (13.4 : 1). 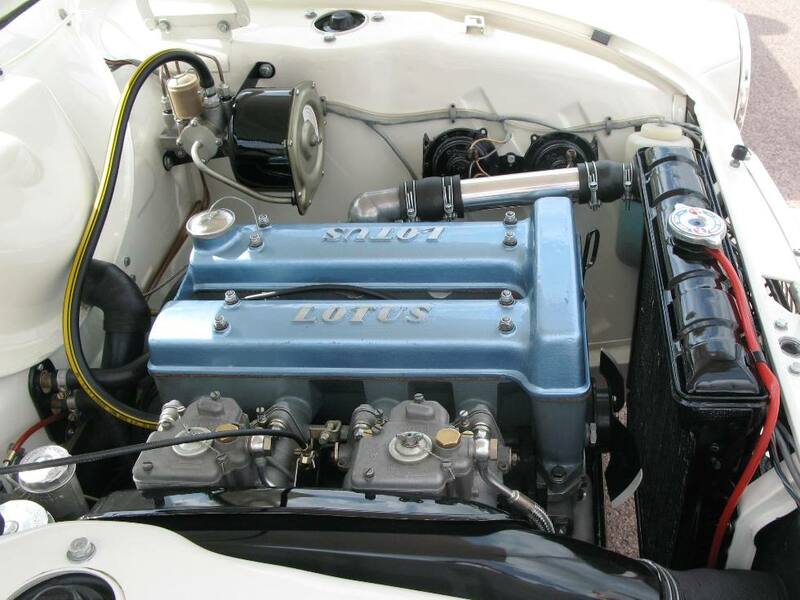 Note on change from Pre-Aeroflow to Aeroflow for Lotus Cortinas. Whilst the standard Cortinas started to be made after the summer break in August 1964, ready for the October Motor Show Launch, the Lotus specific parts such as dashboards / instruments are shown in the parts manual as being from October 1964. Nov ’64 Interim ratio box introduced replacing the close ratio box. This was the G.T box with 2nd gear changed from 2.39:1 to 2.04:1. (Jan ’65) Cam Cover colour changed from Dark Hammered Blue to Light Hammered Blue (Cortinas and Elans). Very approximate date. (Apr ’65) Servo Clip-on Air Filter cover replaced by plastic filter cover. Apr ’65 Headlining change from ‘Confetti’ to ‘Lodestar’ pattern. (Jun ’65) Engine breather tube venting from cylinder head to atmosphere below engine (common to most Kent engine Fords) redesigned to vent into carburetor air intake box. Note that this is approximate date only, and not implemented on Elans until mid 1967. (Jul ’65) – Jim Clark wins the Indianapolis 500 race at the end of May, and a commemorative shield was added to the centre console (and to the front wing of the Elan S2). Production of the Type III started in June 1965. It seems likely that this change was to implement the change from ‘A’ Frame to leafspring only to begin with, with further changes to brakes, trim and gearbox later on in October ’65. Whilst there are some cars known with leafspring from June 1965, there are also some cars with ‘A’ Frame suspension from September 1965. There are a lot of ‘transition’ cars! The A-Frame rear suspension replaced by leaf spring setup, as used on the GT but with Lotus-specific 5 leaf ‘reverse eye’ springs. As the strength had been put back in to the rear suspension / monocoque with the leafsprings, the strengthening bars (Kingposts) inside rear wings were deleted. Without the bars, the boot lid support mechanism was deleted and standard boot support springs now used. The spare wheel could also now resume it’s ‘normal’ position in the nearside spare wheel well. The ‘works’ KPU race, rally and press cars were prototype leaf spring cars with chassis code ‘EU’ (Feb ’65) and all had the servo still at the bulkhead. Some early leaf spring cars had some ‘A’ frame features left over on the axle and / or chassis, leading to the belief that some shells had been converted at the factory from ‘A’ frame to leaf spring, and early axle casings were used up, with their old ‘A’ frame attachment points cut off. The introduction of the leaf spring suspension reduced the wheelbase to 248.9 cms. and a shorter propshaft was installed. 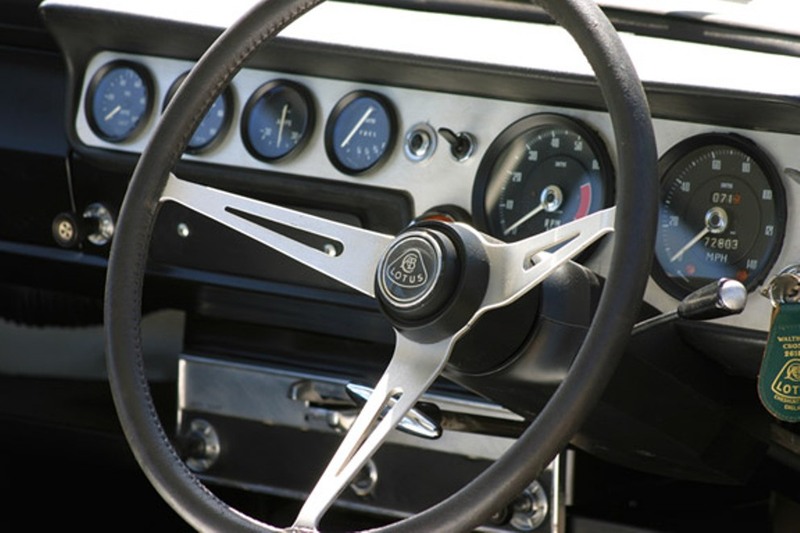 The decision to build a left hand drive version of the Lotus Cortina was made, and this required a couple of modifications to be made to the Lotus which were applied to both Left hand Drive and Right Hand Drive cars. Specifically, the servo was moved to a position at the front of the inner wing (to make room for the pedals on the LHD car), and the horns were re-positioned behind the grille. Oct ’65 2000E gearbox, GT (P16) callipers with calipers in front of disc to aid cooling. Oct ’65 Self adjusting rear drums fitted. Oct ’65 An oval ‘Ford’ badge replaced the oblong badge previously fitted to the lower rear of the passenger front wing. Note that these were made alongside the RHD version, but were designated as a different Type by Lotus due to the amount of Lotus differences around the dashboard, handbrake, steering, pedal box and engine. The LHD cars destined for North America and Canada were fitted with the S/E engine and a pre-engaged starter, with a few other detail differences in the instruments, lighting and badges. For some North American markets a full width front bumper was fitted. This section to be expanded. They were subject to the same changes as the Type III cars. Sep ’65 Start production of Left Hand Drive Lotus Cortinas. Press Release date for announcement 21st October. The Lotus Cortina was rushed into production early in 1963, and whilst the ‘A’ Frame rear suspension was a Lotus design, pinched from the Lotus Seven, it was seen even by Lotus as being a poor compromise in improving the handling of the car. Colin Chapman wanted something a little more sophisticated, and at the end of the racing season in 1963, they took one of the race cars, 167RUR, and sought to re-develop it as a road car, with improved performance and brakes and with improved and more reliable rear suspension. Increasing the performance was straightforward enough, and 167RUR received a higher compression ratio engine, combined with re-profiled cams and re-jetted carburettors. In order to improve both the braking system and the rear suspension, a fairly radical re-design was completed, and a modified Elan setup was installed. This was essentially an Elan differential bolted onto rubber mountings in a new fabricated carrier on the strengthened boot floor. Elan rear McPherson struts were attached to Lotocones bolted onto the rear tubs, which had been modified with a section of Elan chassis welded in. The struts were further located by newly fabricated wishbones, with centre driveshafts transmitting power from the differential output to the outer driveshafts via standard Elan Rotoflex couplings. With this modification came the disc brakes of the Elan, and the 5.5 inch servo tank of the original car was upgraded to the 7.5 inch tank normally fitted to the larger cars. 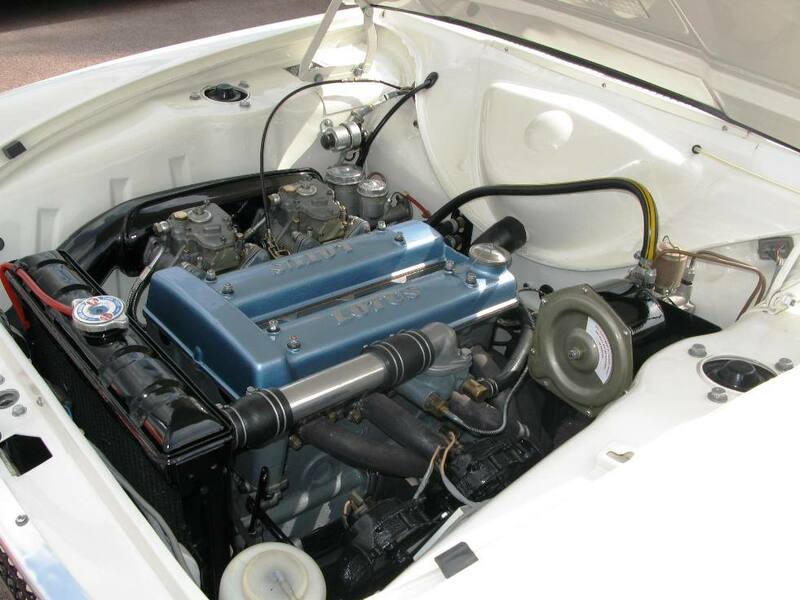 This Special Equipment car was presented to Ford as a new, high performance Lotus Cortina. However, Ford rejected the proposal on the grounds of cost, and given the issues with the ‘A’ Frame reliability, it was seen a being too complex and just a step too far to implement on a Cortina! The car was re-registered as 550VAR, and Jim Clark nabbed it, driving up to his farm in Scotland where it remained for the rest of his life. Up-rated ‘C’ Type camshaft with associated re-jetting of the carburettors and 32 mm chokes, with change to the distributor dynamic advance. A ‘Special Equipment’ badge, fixed on the nearside of the rear panel. The high compression and ported head as fitted to 550VAR was not part of the standard offering, but could be bought as an extra. The S/E package added nearly 10% to the cost of the car, which pushed the price up from £1100 to ‘just under’ £1200 with taxes (With the car, the price was £65 16s 11d, but if added retrospectively, it was £99 12s 6d). The earliest mention that I can find of the S/E model is in Jan 29th 1964 Motor test of the standard Lotus Cortina. 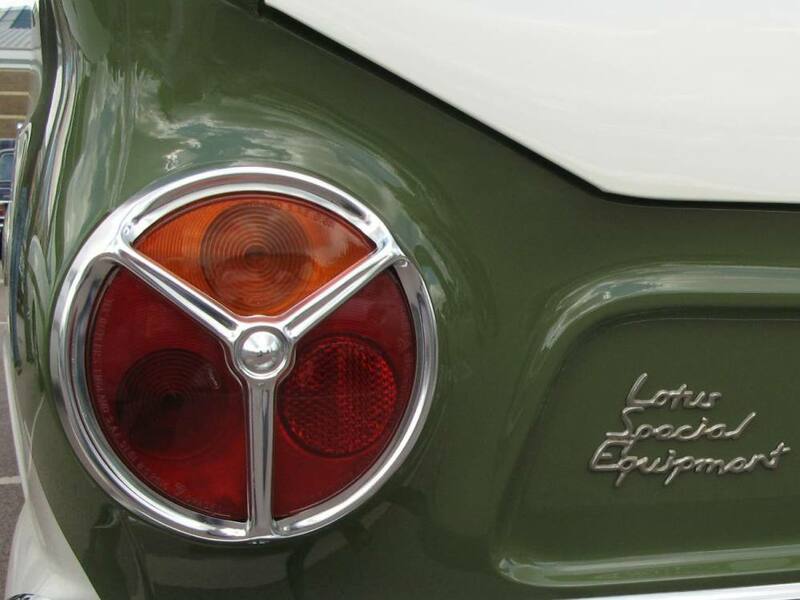 The work was carried out by Lotus Components Ltd, and they recorded that 64 cars were converted. However, this is seen as more of a tax position statement than a statement of how many were actually done! The S/E conversion was a very good earner for Lotus, although the items in the package were excluded from the standard Ford warrantee. 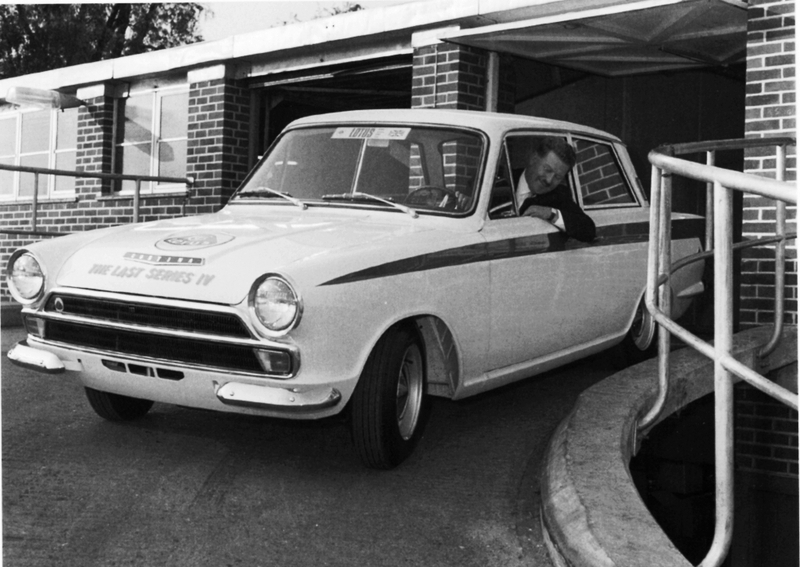 Graham Arnold said that a good 30% of all Lotus Cortinas made had the upgrade, with quite a few more, especially in the later years, having just the engine upgrade to 115bhp. This makes sense, as over one third of Elans had the S/E upgrade, and they needed the additional power less than the Cortina did. 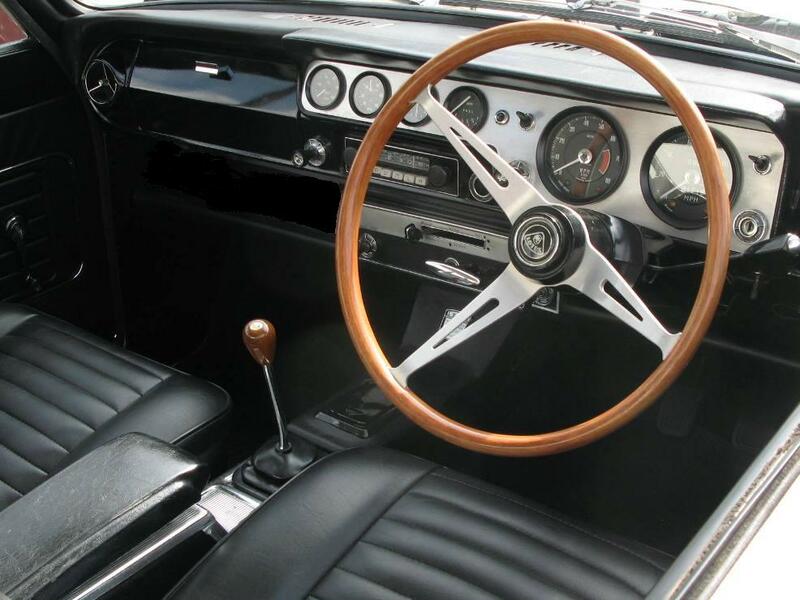 The only change to the S/E specification came about when the Aeroflow car was launched, and the S/E cars received a leather covered rim on steering wheel, with the spokes in the same ‘T’ shape configuation as the woodrim..
During the life of the Mk 1 Lotus Cortina, the vast majority of the cars were painted in white with a green stripe. A group of cars were painted in Monaco Red for the competition department in Boreham, and whilst the Alan Mann Racing cars were painted Red and Gold after 1964, they all started out as while cars, re-painted by Alan Mann. Over the life of the Mk 1 Lotus Cortina, it’s very obvious that Ford slowly got their way in moving the car to a much more standard and rationalised platform, with more and more components being used in common with the other Cortinas in the range. Their argument was helped considerably by the inability of the early cars to compete in the European and African rallies, with the GT being used very successfully. However, once the A Frame had been replaced by the leaf spring setup, the car had a brilliant, if short, series of rally successes, whilst it continued to be competitive on the track. This rationalisation and ’model’ for producing a high performance saloon car paved the way to the next generation, the Mk 2 Lotus Cortinas, and of course, the mighty Escorts. Notes on Transition from ‘A’ Frame to Leaf Spring cars. There is considerable ambiguity around the actual date of availability of the ‘official’ leaf spring model. On one hand, the Ford notice to Dealer Principals on 20th Sep ’65 (see ‘Change Notices’ in the ‘Books’ section) instructs the dealers that the model will be released for sale on 18th Oct ’65. And yet in the Sporting Motorist magazine Sep ’65 (issued in Aug) it is reviewing a leaf spring car which was released ‘comparatively recently’, and Motor magazine, reviewing the evolution of the Lotus Cortina in May ’66 has the change to leaf spring as Jul ’65. All of the KPU cars were built as leaf spring cars, registered on or before Jun ’65 (with chassis build dates of Feb ’65), and the Ford Parts list has the leaf change also as Jun ’65. What is not in doubt is that the sales of the ‘A’ Frame cars had slowed down considerably early in 1965 having developed a very poor reputation for reliability, and the majority of stock had to be moved on before the ‘more desirable’ leaf spring car was commonly available. Ford had the responsibility for sales, but Lotus, according to Graham Arnold, were selling the new (converted) leaf spring cars as the ‘A’ Frame cars were still being were made. So we have at least two ‘release’ timeframes; one by the book (and stuck with old stock) and….Lotus. However, it is also understood that this was an agreed arrangement, whereby Ford would take the hit on unsold stock, whilst allowing the cash-strapped Lotus to better support their cashflow position. 1965 was a very busy year, and as it turned out, a very successful one for both Lotus and for Lotus-Ford. A few changes were made retrospectively to the ‘A’ Frame cars in order to manage Ford’s reputation for reliability and longevity of their product. The ‘A’ Frame system was inherently weak for a road car, and whilst Ford attempted to ‘patch up’ cars even 3 years later, they also offered to replace the ‘A’ Frame with the reliable leaf spring system. Most cars were changed to leaf spring, either by independent specialists such as IWR, or by Lotus or Ford. Few survived into the 70s with their original rear suspension. Aug ’65. (Retro Change for old ‘A’ Frame models) Replacement of small ‘A’ Frame mounting brackets with larger brackets to more effectively spread the load. Dec ’65. (Retro Change for old ‘A’ Frame models) Change to procedure in replacing small ‘A’ Frame mounting brackets by using gas brazing with nickel bronze rods only. Jan ’66 (Retro Change for old ‘A’ Frame models) Reworking ‘A’ Frame brackets showing specific chassis numbers. Upto Z74D424359 and from BA74E59121 to BA74EG59479 inspect and change in required. Between Z74D424359 and BA74E59121, Replace in any event. THIS SECTION TO BE MOVED INTO THE ORIGINALITY SECTION……. 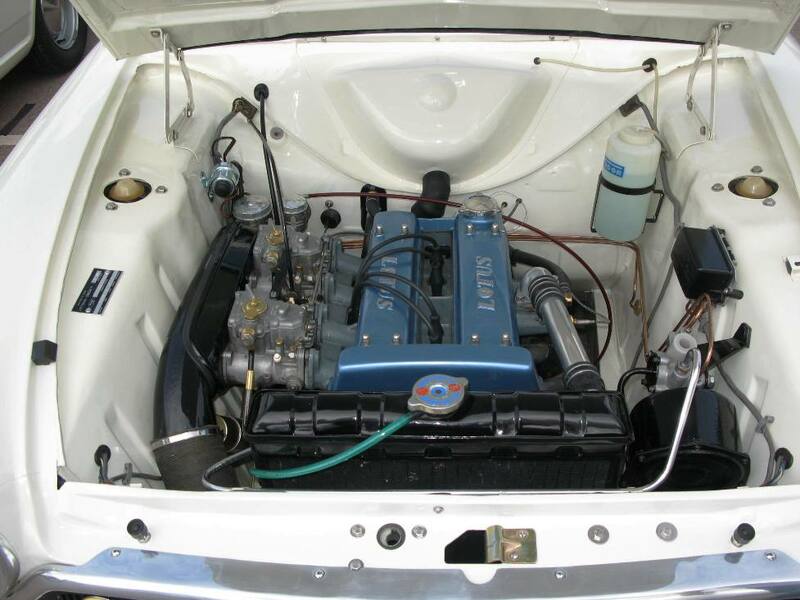 This shows the main areas of the Mk1 Lotus Cortina variants. This is the S/E Aeroflow dash, with the leather covered steering wheel. Notice the correct original GREEN key fob just in the picture. The early ‘studded’ rim, (Feb 63 to Oct 63). Spokes in ‘Y’ shape configuration. Dummy hornpush with yellow / green badge. The thin rimmed non-studded wood rim (Oct 63 to Oct 64). Spokes in ‘Y’ shape configuration. Yellow / green hornpush. The thick rimmed non-studded wood rim (Oct 64 to Oct 66). Spokes in ‘T’ shape configuration. Dummy hornpush with Black / Silver badge. The leather covered S/E rim. Only fitted to Aeroflow S/E cars. These pictures show the three different woodrim wheels, front and back. There will be many more ‘general’ pictures in this section, and of course, the detail definition sections will be identifying the main components and sub-assemblies in considerable detail.